For one reason or another, Englewood has never had its own alderman. The Greater Englewood area, like many parts of Chicago outside of the city center, was developed piecemeal by land speculators attracted to the marshy swampland because of its proximity to rail infrastructure and later, the Union Stock Yards. The neighborhood wasn’t annexed into Chicago until its construction had been humming along for about forty years, in 1889. The city’s ward maps for 1900 show the area split into two wards, the 30th and 31st (both of which are now on the Northwest Side). The number of wards slicing up Englewood has only risen since then, a trend which has hamstrung the neighborhood’s chances at political power or self-determination. This phenomenon can be partly explained by the fact that Englewood did not develop as one cohesive community, warranting its own representation. The area gradually developed as several discrete communities—Junction Grove, Normal Park, Ogden Park—that over time, drew closer through density and circumstance. However, the city undertakes a Census-driven ward remap process every decade, and court challenges inevitably follow nearly each one. The city has had ample opportunities to draw a unified ward for Englewood. Since the 1970s, Englewood has remained split across at least five wards. According to James Lewis, a researcher with the Great Cities Institute at the University of Illinois at Chicago, the area has suffered from both its proximity to more powerful neighborhoods that make up the core of their own wards—like Bridgeport in the 11th Ward, or Chatham in the 6th—and its lack of formal power structures recognized by the map-makers in City Hall. And with city population on the decline over the last several decades—a decline driven largely by Black residents leaving the city due to disinvestment on the South and West Sides—more powerful South Side wards have had to extend their boundaries to pick up more constituents, carving up Englewood in the process. “It becomes an area where the maps divide the population off into other wards,” Lewis, who is also a senior associate at demographic research firm Rob Paral and Associates, said in a phone interview. 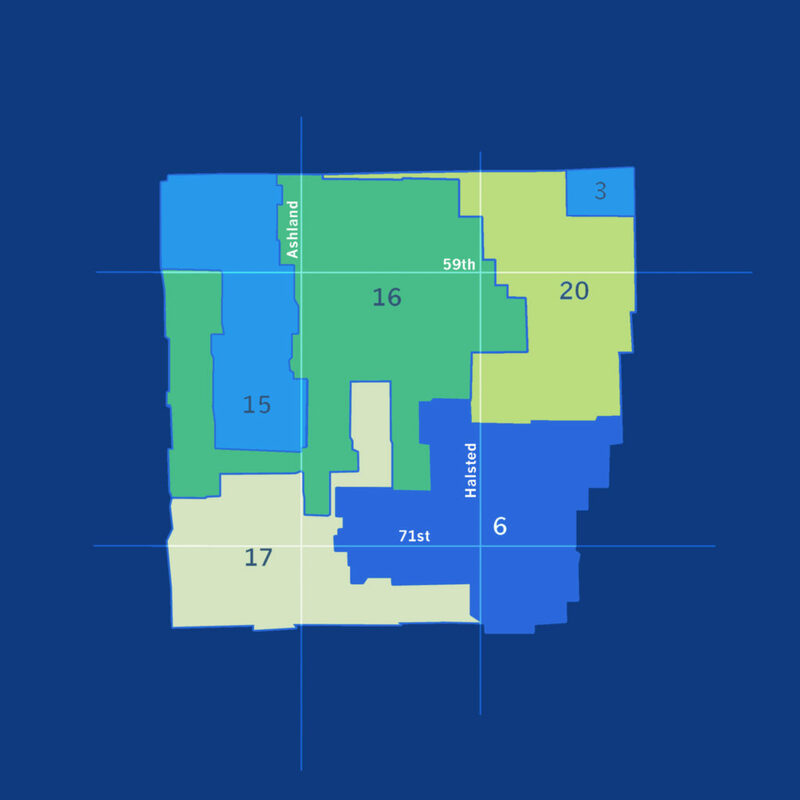 That explains the current ward map, which provides for just one ward—the 16th—that is based wholly within Englewood. The other four wards take up substantial parts of the neighborhood, but have power bases elsewhere. The 20th Ward has long been considered Woodlawn’s ward. The 6th belongs to Chatham and Park Manor, while the 17th ward is based in Chicago Lawn. One of the most misshapen wards in the city, the 15th is more or less equally split between Brighton Park, Back of the Yards, and a western portion of Englewood. (The 3rd Ward, which runs from the South Loop through Bronzeville to Washington Park, also covers a small northeast corner of Englewood.) The aldermen representing these wards adhere to these power bases; only 16th Ward Alderman Toni Foulkes is an Englewood native. Aldermen have extraordinary power over what happens in their wards, from building permits to licensing to zoning—far more than city council members have in any other large American city. They can also help funnel resources like anti-violence organizations or job programs into their neighborhoods. Thus, the division of a community among five or six independently elected officials, with no formal incentive to coordinate economic development, public safety initiatives, or the marshaling of city and state resources inevitably leads to disinvestment. The effects are even more devastating in poor communities facing population loss and decades of systemic racism. Sociologist Rob Vargas, who directs the University of Chicago’s Violence, Law, and Politics Lab, noticed a similar pattern in his research on gang violence and civic life in Little Village. Residents of the 22nd Ward, which is based in the western portion of the neighborhood, enjoy and benefit from close connections with Alderman Ricardo Muñoz; while the eastern portion, split between the 12th, 24th, and 28th Wards, lacks “access to the systemic social organization necessary for preventing violence,” Vargas wrote in his 2016 book Wounded City: Violent Turf Wars in a Chicago Barrio. There are some 5,000 vacant parcels of land in Englewood, and underutilized commercial corridors that stretch across the area’s entirety, often crossing between at least two wards. Huge industrial development projects, like the expansion of the Norfolk Southern railyard, move forward with the public support of just one alderman, while huge commercial development projects, like the revitalization of 63rd and Halsted Streets, remain in stasis for years partially, at least, because it’s unclear whose ward would benefit more, and who would get the most credit. This story is the first in a series examining the past, present, and future of political representation and fragmentation in Englewood. I think this is a Great article. Should be shared throughout EngleWood . Explains a Lot! Great information! I’m considering purchasing a property on the Englewood area within a about 9-10months. When I tell people that, you should see their reactions. I believe Englewood can be restored back to the gem that it once was. Englewood is so large, having one Ward would be like operating a mini City Hall. 1.Perhaps the solution is to have two Wards in Englewood. One that covers East and West. This will allow Englewood more cohesion while providing attention and access to its people. We live within the border of the 6th ward, our Alderman (Sawyer) is actively engaged and interested in what is happening. However, I realize five (technically 6!) wards is gerrymandering at its best. 2. Finally, since there are so many different ALdermen for Englewood, you never quite know who’s ward you are when out and about, so perhaps all Englewood Alderman should indicate who the other Alderman are, defined by street boundaries. This would be informational for residents and thereby (sort of) fostering mutual interests and awareness among Englewood residents and Ward offices. I was raised in Englewood and I am still here running a home Day care business I want to look into a day care business in the heart of Englewood. I Love my community. I live in Albany Park on the northside. We are in 3 different wards which seem to do the same things as in Englewood, that is, inhibit our ability to organize as a community. Maybe the gerrymandering would stop if communities participated directly in the decision of where to put ward boundaries. We should hold the city accountable for giving us truly representative wards as well as aldermen who are accountable for the success of the wards. My question is HOW do we go about assigning one Alderman to the entire Englewood community so that someone is held accountable for it’s growth and development as well as it’s stagnation. I totally agree with the closing comments of the article – Englewood’s future, our future and the generation to come – that “No one really has a clear focus on the development of Englewood. When you have the luxury of the Obama library and the luxury of a university and the luxury of all this other development in Woodlawn, it’s really easy to forget a community like Englewood.” This statement sums up the status of Englewood. Thanks for the information. I always wanted to know, why so many wards in one community. (Englewood) This explains things. I love my community. There is life and beauty here. Thanks for the article. I look forward to reading those that are forthcoming. Very informative article. I always wondered, why so many Alderman for one community. I now know. Looking forward to up coming articles. With no cohesiveness we all suffer. Englewood is a area of beauty despite what others may say. Informative article! The residents Englewood are passionate & committed to their community and deserve a single Council member who is equally committed.